What exactly is GDPR and do I need to worry about it? The General Data Protection Regulation standardizes data protection law across all twenty-eight EU countries and imposes strict new rules on controlling and processing identifiable information. All websites collecting data from EU citizens must meet these GDPR requirements. Failure to comply can result in fines up to €20 million or 4% global turnover, or compensation claims for damages incurred. You may also face damage to your reputation and lose the trust of customers. So, if your website is frequented by visitors in the European Union, it pays to be prepared. Fortunately, it doesn’t need to be difficult or time-consuming. That’s where we come in. Our ultimate toolkit is built specifically to ensure that your website is compliant with all GDPR rules. Stress-free and easy to use, you can meet all requirements in just a matter of clicks. We pride ourselves on providing every customer with high quality, ongoing support. If you’ve got a question or need assistance with our plugin, feel free to get in touch at any time. We endeavour to get back to all queries as soon as possible. LIKE US? PLEASE RATE US! Your ratings and recommendations will help us continue to improve our plugin and better protect your site. - feature: Added compatibility for Instagram Feed plugin. - feature: Added compatibility for Formcraft Basic plugin. - feature: Cookie popup 'Read more' can be open in a new tab instead. - feature: Added HotJar integration. 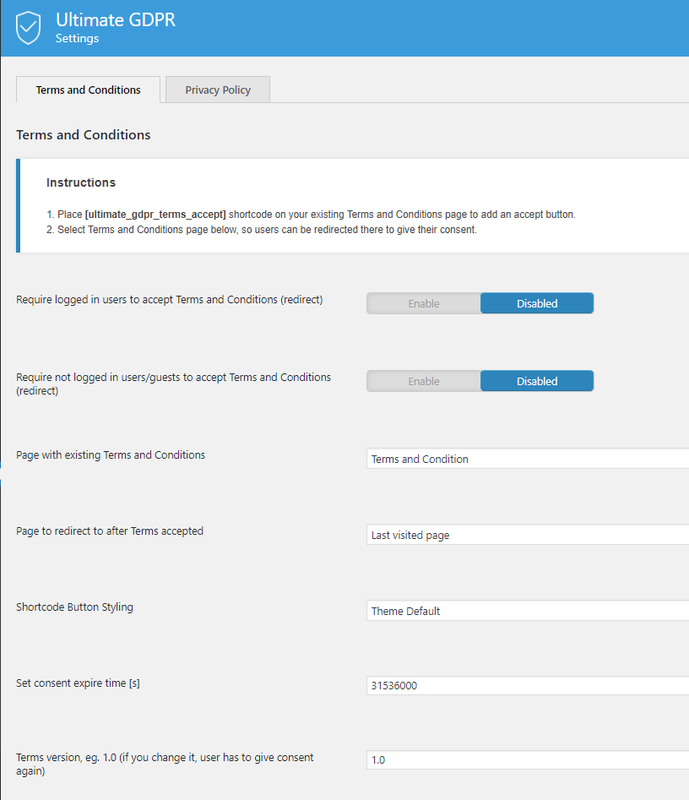 - feature: Added new (optional) checkbox for WooCommerce consent. - bugfix: Modal styles are not changing when the Cookie modal skin option is used. - bugfix: Added missing Norwegian translation for the Cookie popup content and fixed other minor issues this option had. - bugfix: Improved functionality of the pseudonymization option due to the WP Job manager issue. - bugfix: Option to add a custom label for 'Protection shortcode' was fixed. - bugfix: Fixed 'checking if the user is from the European Union' function. - feature: Added integration with Mailer lite. - feature: Added compatibility with YITH WooCommerce Wishlist. - feature: Added compatibility with Custom Facebook Feed Integration. - feature: Added option to add custom URL for Terms and Conditions. - improvement: Plugin styles were optimized. - improvement: Added loader and improving styles of the Unsubscribe tab. - improvement: Updated Cookie Popup styles. - bugfix: QuForm form was missing from 'Data breach' section. - bugfix: Read more button can be hidden when not 'Read more page' is set in the settings. - bugfix: Advanced Cookie popup added by [ultimate_gdpr_cookie_popup] didn't want to hide. - bugfix: Improved responsive of the Render cookies list for smartphones. - bugfix: Changing the Modern mobile style back to the old version. - bugfix: Fixed Oreo skin button size. - bugfix: Improved the Form Skins styles when using Twenty Nineteen theme. - feature: Compatibility with CF7DB plugin was added. - feature: Compatibility with LayerSlider WP plugin was added. - feature: Improving Jetpack compatibility. - feature: Added option to hide 'Unsubscribe' tab. - improvement: Fixed responsive design for cookie list. - improvement: Admins will be informed about the number of pages which scan failed. - improvement: Admins will be able to see the addresses of the pages which scans failed. - improvement: Admins will be able to do a second scan for the pages which couldn't be scanned the first time. - improvement: Swedish translation added. - bugfix: Variable options are no longer blocked for the WooCommerce Variation Swatches plugin. - bugfix: The non-registered users could receive credentials or emails addresses of other users (Mailster). - bugfix: Some cookies were still blocked despite activating correct group. - feature: Google Analytics - Tracking users anonymously now is available. - feature: Compatibility with GA Google Analytics plugin was added. - feature: Compatibility with Disqus Conditional Load was added. - feature: Compatibility with Caldera Forms was added. - improvement: Fixing minor style issues Cookie scanner. 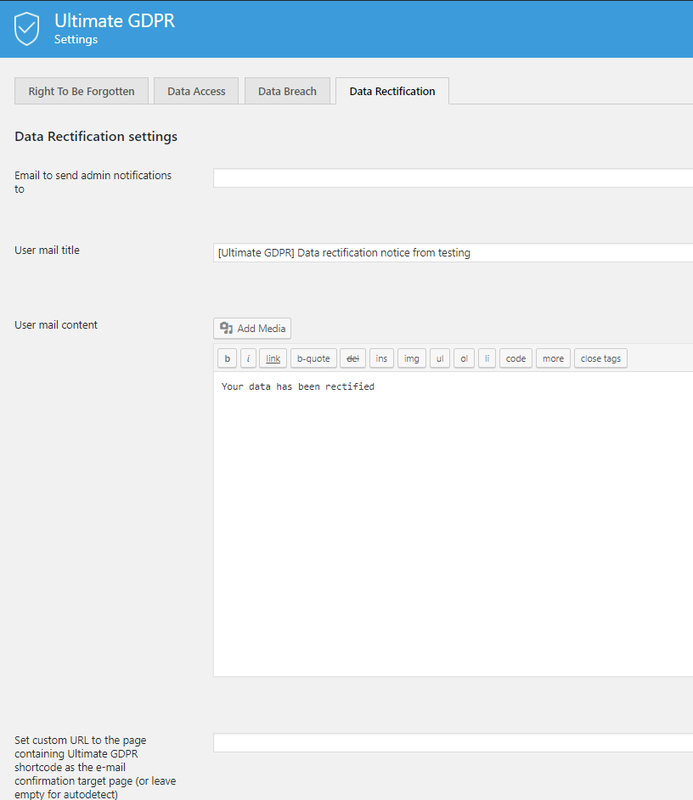 - improvement: Extra space under the data rectification tab was removed. - improvement: improving caching for WP Rocket. - bugfix: Privacy center Cookies will open the correct tab of User Settings of User Settings. - bugfix: MY ACCOUNT email subject translations fixed. - bugfix: Data access requests couldn't be accessed via the backend view. - bugfix: Activating the Ultimate GDPR plugin causes error 500 for non-logged in users. - bugfix: Some of the local cookies weren't blocked despite the "block all" option enabled. - bugfix: Added solution for the error 500 at submitting a data request in WP Admin. - bugfix: Fixed minor styling issue with cookie modal skin. - bugfix: Data access form reload instead of showing a message on site. - bugfix: Cookie notice box - impossible to add a background image. - feature: added new cookie info skin (Classic Light). 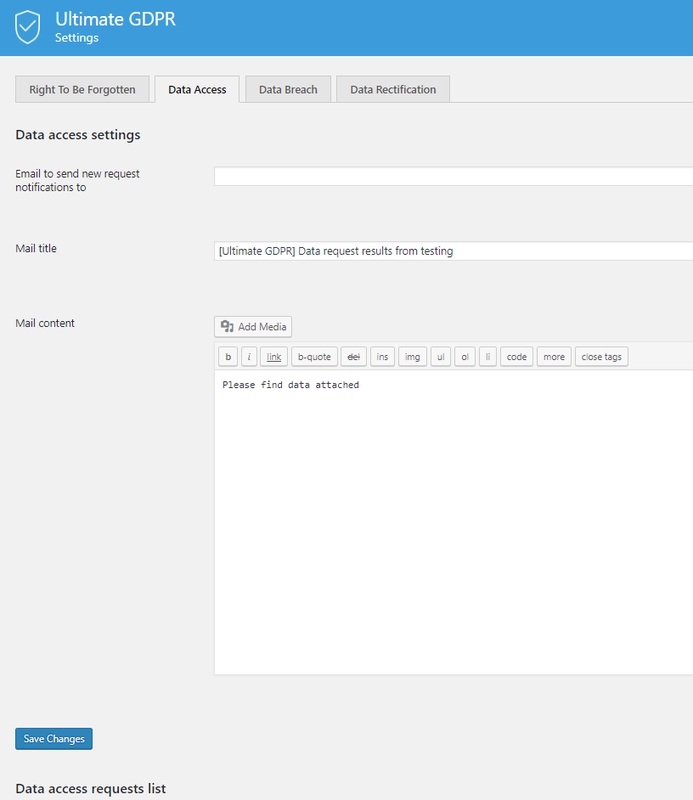 - feature: added compatibility with Mail Bank – WordPress SMTP Plugin. - feature: added compatibility with Delivery Date for WooCommerce. - feature: compatibility improvements for PHP 5.4+ version. - improvement: updated the information about plugins compatibility. - improvement: cookie popup skin style improvement. - bugfix: 'show only icon option' for trigger button was fixed. - bugfix: service consent checkboxes labels are clickable. - bugfix: Improving the compatibility with the WP Rocket caching plugin fix. - bugfix: Fixing Italian translation used for the plugin. - bugfix: eFORM - The Cookie Consent is not showing at the end of the form - fixed. - bugfix: js incompatibility issue with Drift plugin fixed. - bugfix: solved problem with not saving the text added as 'User mail content'. - feature: Protection shortcode added - content which requires cookies consent will be blurred until consent is given. - feature: 3 New Cookie Modal styles added. - feature: Google Ads and Google AdSense compatibility added. - feature: Service names now can be edited for 'Forget me' form. - feature: Cookies Settings and Services Manager Export/Import option added. 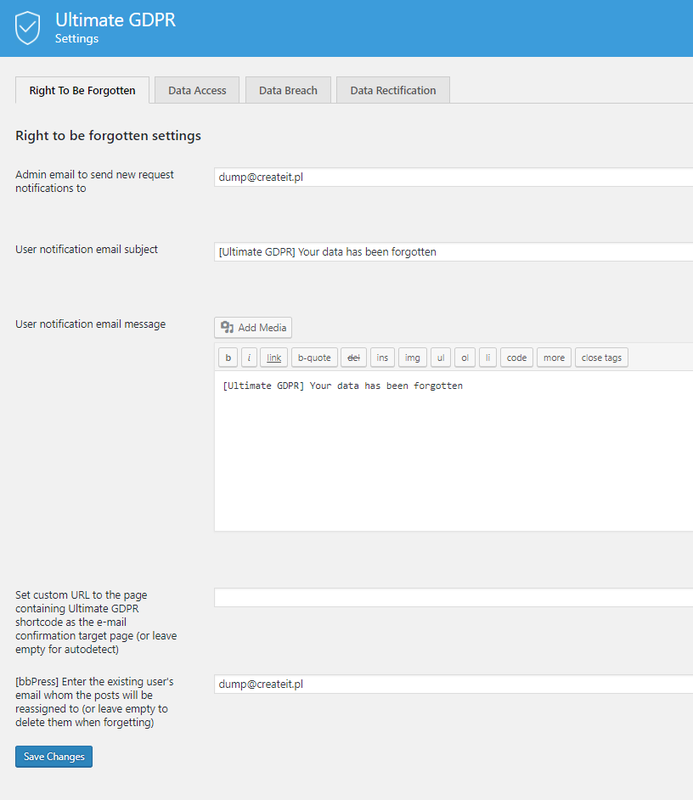 - feature: Services names in Forget Me Form now can be edited. - feature: Klaviyo plugin integration added. - feature: Metorik Helper integration added. - feature: PixelYourSite Pro integration added. - feature: wpForo plugin integration. - improvement: Emails of recipients in Data Breach notification are encrypted now. - improvement: Improving style compatibility with premium themes. - bugfix: Setting language via pages settings fixed. - bugfix: Issue with cookie consent info for non-logged users when WP Rocket plugin fixed. - bugfix: Editing labels in Advanced settings fixed. - bugfix: Removing WP User data via Right to be forgotten issue fixed. - bugfix: Autofill for the Lists of features section fixed. - feature: Cookies consent log now contains also non-registered users consents, based on IP or user agent. - feature: Cookies Content settings and Service export added. - feature: Downloadable logs will also contain user e-mail (If the user has an account on site). - feature: Added compatibility with MailPoet Newsletters plugin. - feature: Added compatibility with Flamingo plugin. 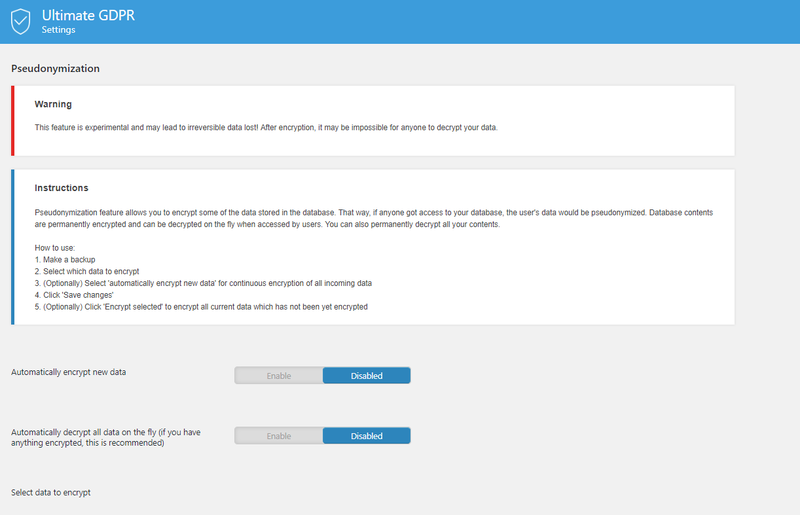 - feature: Added option to remove data storage consent to unsubscribe page. - improvement: Added possibility to write a simple text in Service's Expiry Time. - bugfix: Sessions cookies will be blocked on site. - bugfix: Page scrolling problem after using Advanced Settings modal fixed. - bugfix: Custom checkbox in registration form bug fixed. - feature: Added ACF compatibility. - improvement: Added cURL compatibility. - bugfix: New style in backend is loading without any issues. - feature: Added human-readable file added to stored data mail. - feature: Wordfence compatibility added. - feature: bbPress compatibility added. - featured: Added option to display Cookie Modal on site using a link. - feature: Cookie scanner functionality improvement and new loader design. - bugfix: Job Manager checkbox available in Forget me Tab even when the plugin is not installed. - bugfix: IE11 error in console when the plugin was activated on site. - bugfix: WPML translation improvement. - bugfix: # added when clicking the Save&Close button. 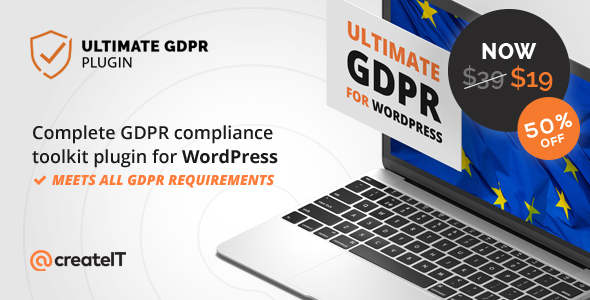 - bugfix: WooCommerce variations are not accessible when Ultimate GDPR is active. - bugfix: Cookie content loader fixed for Czech and Portugese languages. - bugfix: Cookie Modal Content translation improvement. - bugfix: Plugin will no longer create a problem for the main menu of the site. 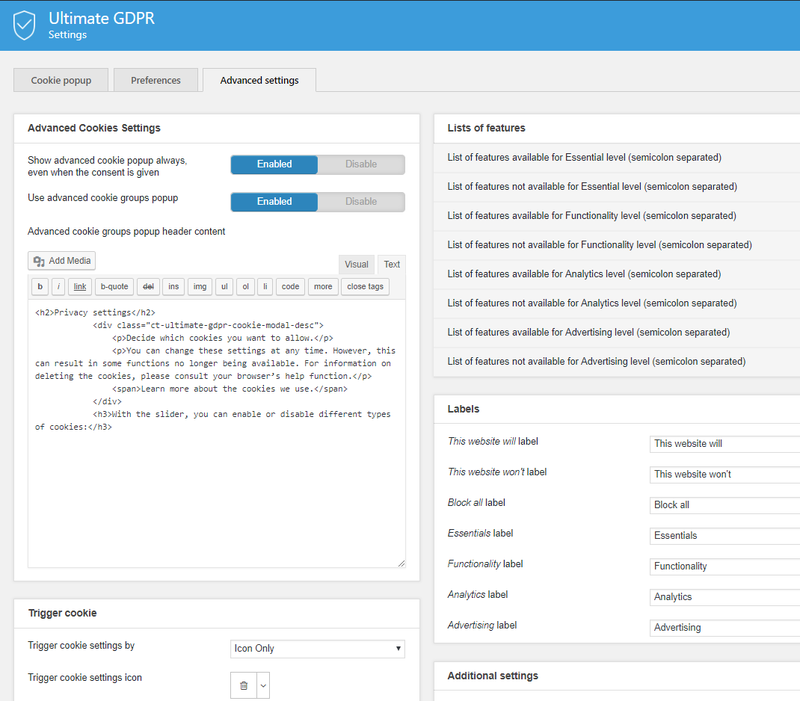 - bugfix: Yoast SEO General settings now work correctly when Ultimate GDPR is active. - bugfix: Redundant paddings removed added to the site when using Advanced Cookie Groups popup. - feature: translation files will be always up to date. No need to unpack them manually anymore. 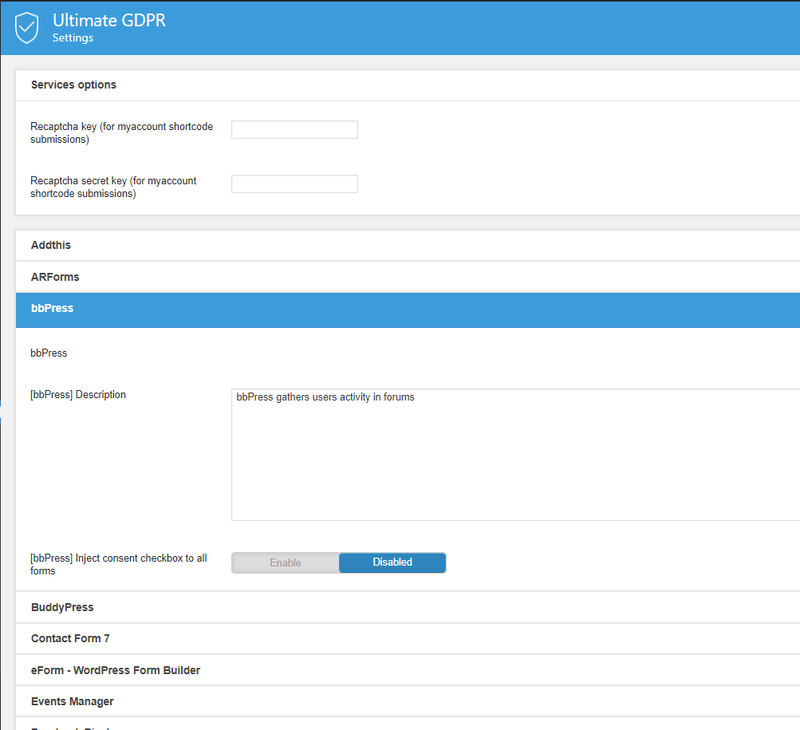 - feature: Compatibility with WordPress GDPR settings. - bugfix: Cookie popup is visible on the site for UE users when 'Check if the user is from European Union' option is check. - bugfix: Autoupdate notification fixed. - bugfix: Wordfence and mod_security compatibility improved. - feature: Revoke Terms & Conditions and Private Policy option. - feature: If no user's data saved in DB - no attachment is sent to user. 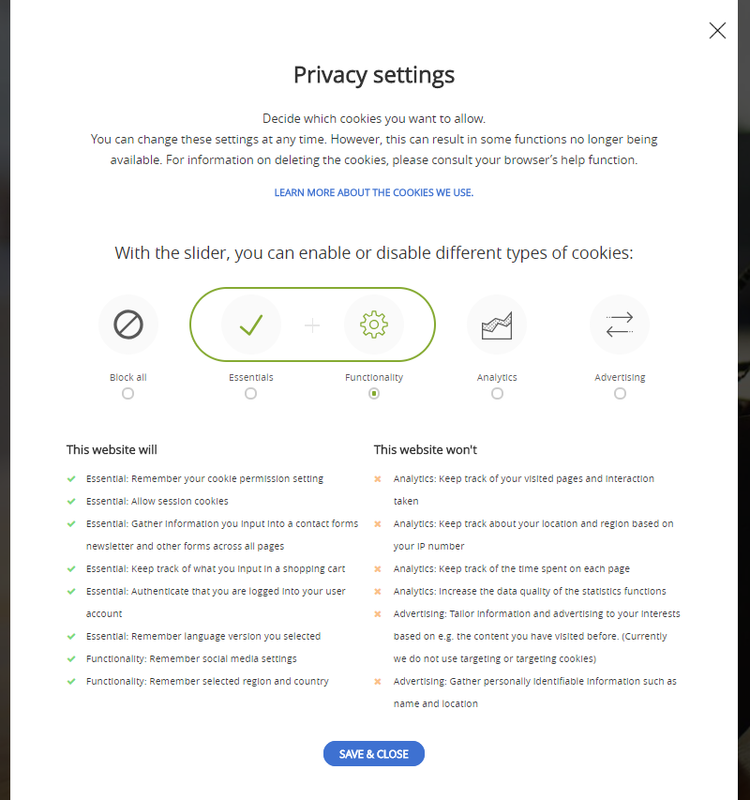 - feature: Additional options for changing cookie notice look. - feature: Compatibility with Mailster - Email Newsletter Plugin for WordPress. - feature: Cookie notification buttons labels now can be edited via admin panel. - feature: Cookie Settings modal now can be editable. - bugfix: Improved plugin update functionality. - bugfix: Privacy settings modal adjustments for mobile view. - bugfix: Privacy settings advanced option will show the correct information what site will do and won't do. - bugfix: Not able to add comment when the checkbox is not added. - bugfix: YouTube cookies can be blocked on the site. - feature: Advanced Cookies Management Panel added. - feature: New language versions added: German, French, Spanish, Norwegian, Russian, Polish, Italian, Dutch, Croatian, Romanian, Hungarian, Slovak and Czech. - feature: Improved integration with Google Analytics. - feature: Possibility to display cookies consent box in the top panel. - feature: Auto update functionality added to the plugin. - feature: Compatibility with Facebook Pixel. - bugfix: Style fixes update. - bugfix: Placeholder link fix for Terms and Conditions. - bugfix: Issue with Data Access when using WPML plugin (data was stored only for the main language). - bugfix: Right to be forgotten request does not show up in the backend and all the fields within the settings become empty. - bugfix: Translating Cookies popup content custom text. - bugfix: Fixed problems with Gravity forms checkbox issue. - bugfix: Removed 'Ultimate GDPR' string from translation. - bugfix: Admin will receive requests notifications from Forget Me option. - feature: BuddyPress integration added. - feature: Formidable integration added. - bugfix: Forget email confirmation link fix. - bugfix: Service wp user filter priority change. - bugfix: Text domain folder set to both wp-content/languages/plugins and wp-content/plugins/ct-ultimate-gdpr/lang. - bugfix: Conflict with Antispam by CleanTalk plugin script was fixed. - bugfix: Cookies are visible on all pages despite the settings. - bugfix: wp post service collects too much data fix. - feature: Added compatibility with Formidable Forms. 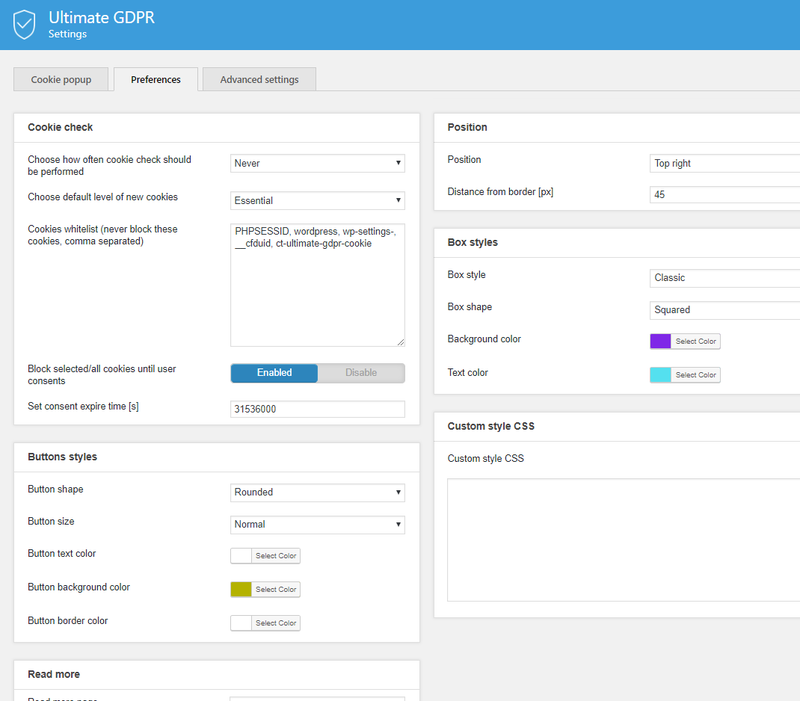 - feature: GDPR plugin integration with BuddyPress data access. - bugfix: Improved code quality. - bugfix: Ultimate GDPR was blocking cookies despite the chosen option. - bugfix: Issue with translating plugin using PO and MO files. Disclaimer: We are not lawyers and this item cannot replace lawyer’s advice. We have tried to make it as accurate as possible to handle GDPR requirements, but if you need a definitive legal advice for your business, you have to hire an attorney. As createIT we are not responsible for your website GDPP compliance and we can’t be held accountable for any legal issues.